After searching for over a year, Jen travelled to Gayfields Welsh Ponies in the autumn of 2000. There she found Gayfields Silver Sprocket, a brown dun (going gray) weanling colt, by *Sleight of Hand and out of Gayfields Silverado. By observing his color transformation through the seasons, Sprocket is suspected to be a roan. The truth of this will show itself once his foals start arriving in the spring of 2003. We expect great things from this colt, judging from his family tree. 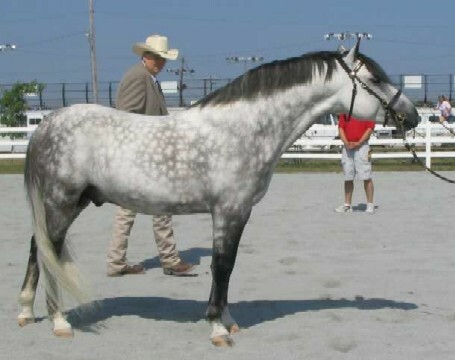 His mother is the dam of Gayfields Mona L, at Rollingwoods Farm in Olive Branch, Mississippi, and his full sister is Gayfields Runaround Sue, at Clovercroft Welsh Ponies in Nashville and Franklin, Tennessee. Both of these mares are producers of champion hunter ponies. Since temperament is so highly heritable, we spent a great deal of time with Sprocket before deciding if we wanted him to be a breeding stallion. He was sent to the trainer the winter of his two-year-old year to learn if he "had it in him" to be sensible and trainable. We were elated at the results! He was quick to learn and did his work with enthusiasm. He has been the easiest pony to work around, even for my non-pony husband, Jeff. After handling several "nut-case" stallions at school, I am amazed how calm and manageable Sprocket is, even in the breeding shed. So he has the mental qualities we were hoping for, but what about physical quality? Not only does Sprocket possess the willing attitude we were looking for, but he is also a brillient mover. We were so surprised when our trainer called us one day to ask if Sprocket was for sale. Apparently, a hunter/jumper trainer saw him moving in the round pen and was ready to load him on their trailer that day. My greatest compliment, though, came from my own trainer. He said to me, "I wish I could get my big horses to move as well as Sprocket." Sprocket's show career has been growing by leaps and bounds! At the 2005 American Nationals, Sprocket placed third under the American judge and forth under the UK judge. This is a HUGE feather in his cap knowing that he really is as nice as I always suspected that he is. 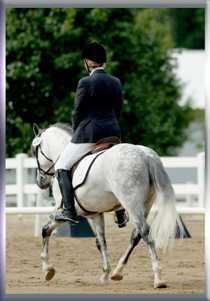 Sprocket also had his under saddle debut at the 2005 American Nationals. His rider was none other than my three-year-old son, Will. In fact, this was also Will's first show where he had the honor of participating. Below is a picture taken of them before their "class". In 2006, Sprocket began showing in English Pleasure. Under the skillful guidance of Mike Rees (trainer) and Melissa Bedwell (assistant trainer) he exceeded my expectations. At his first show under saddle, Sprocket won the Welsh English Pleasure against all sections as well as the Open Pony English Pleasure class. His second time out was at the Heartland Welsh Show where he won all three classes and took home the Championship. Although there were only three ponies in these classes, Melissa found the challenging changes of gait that were called a very fun exercise for Sprocket. Our next stop was the Ohio Welsh show. Here, the English Pleasure classes had nine in them, but Sprocket was able to deliver again. 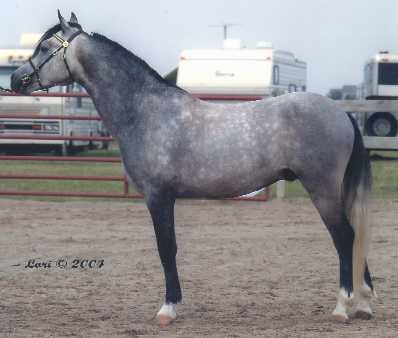 He took secon place in the conformation class, won the working class and won the stakes class. He also walked away with enough points to be named Champion English Pleasure. Our final stop in 2006 was the Centennial/Central National Show. We also found ourselves in another large division where there were 10 ponies being shown. Sprocket took home a forth and two fifth place ribbons. He was a very good boy at this show and never made a mistake. I couldn't be happier with how our year went. 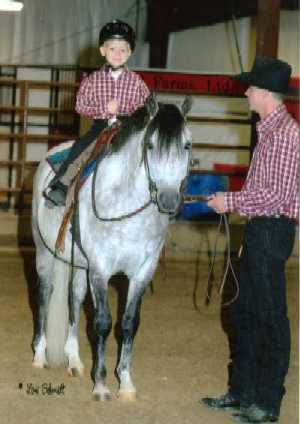 Also in 2006, Sprocket made a repeat performance as a lead line pony. 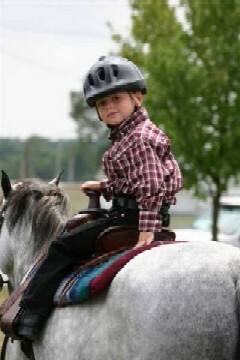 In this picture, we see four year old Will Sommer showing "his" pony at the Centennial. Will took home a beautiful pink ribbon from his class and now keeps it hanging in his room with the rest of his ribbons. Sprocket has started off 2007 with a bang. In April, Sprocket was invited to represent the Welsh breed at the Equine Affair in Columbus, Ohio. He was such a good boy and loved all of the attention he received at this prestigious event. In May, Sprocket returned to Edinburgh, IN which was the same location where he made his under saddle debut in 2006. This was the site for the Indiana Saddle Horse Association’s spring show. Like the previous year, Sprocket’s favorite color was blue. He ended up winning the Open Pony Halter, Open Pony English Pleasure, Welsh English Pleasure, Section B 3 & over Welsh Halter and was named Supreme Champion in halter. He also carried five-year-old Will Sommer to a blue ribbon in lead line. On Sunday that weekend, it was time for Sprocket to unveil what he had been working on all winter, dressage! This was the first time Sprocket had ever seen the scary, white dressage ring but he handled it well. In his first class (Training Level 1), he did jump at the rail once and finished with a score of 63.5 which was enough to win the class. But his star shined brightest when he went in for the Training Level 2 test. At home Mike Rees, Sprocket’s trainer, had said he thought Sprocket could score a 68 at this show, but after seeing the scores given out for Training 1, Jen was less optimistic. Well, Mike was right because Sprocket walked away with a score of 68.9 for Training Level 2. Our second show of the season was the Brown County Horse Show in Georgetown, Ohio on June 16th. Sprocket was, once again, a wonderful ambassador for the Welsh. He won Pony Halter as well as Pony Pleasure. For grins, Sprocket was entered in the Open Halter and competed against horses of all shapes and sizes. There were eighteen other horses and ponies in this class and Sprocket walked away with second place. We are all very proud that this 13.0 hh pony can actually stand toe-to-toe with the big horses and still do well. The next outing will be a dressage show in early July, then it is on to some Welsh shows (Heartland and Ohio) followed by the ISHA fall show in September where he will once again be shown in dressage. At Sprocket's final dressage show, he once again continued to "wow" me. He looked stunning and scored well against some really lovely horses. He took the second in his Training 1 test, but followed that up with a blue in Training 2. The score he posted for Training 2 was enough for him to be awarded the Reserve Champion for Training level at this show. I would like to that Jennifer for this beautiful picture of Sprocket. Sprocket has once again begun the show season with a bang. At the Brown County Invitational, he walked away with the blue ribbon in Pony Pleasure under the skillful guidance of Missi (Bedwell) Hayes. Considering Missi has only been back in the country for a week, I was very pleased that she was even interested in showing Sprocket and even happier when they won their class. Here is a picture of the pair during schooling on Friday before the show. I really like this picture because Sprocket looks like a carousel horse, even down to the curl in his tail. This year continued to make me proud. 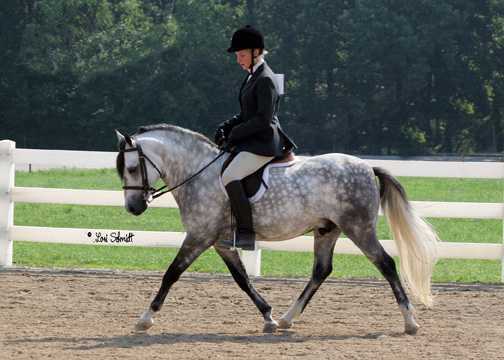 Sprocket and his oldest son, a half-Welsh gelding by the name of Sommertime Zoot Suit Riot, made their way to the National Dressage Pony Cup. Both boys did well with scores in the high 60's to low 70's in Training and Into, respectively. Sprocket was amazing this year! Not only did he carry two different children in leadline classes, but he was also brilliant in English Pleasure and Ridden Pony. In English Pleasure, Sprocket ended up 4th in the NE Region even though the only NE shows he attended were the Ohio 1 & 2 shows. 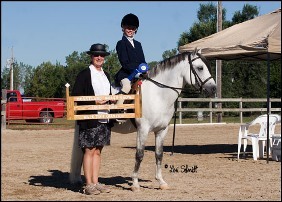 In Ridden Pony, he was Reserve Champion in the NE Region and Champion in the NC Region. 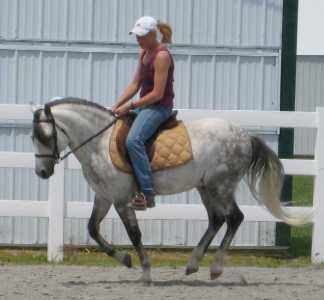 But the biggest feather in his cap is that he ended up third in the NATION in Ridden Pony. Because we are a small farm, geting a National award from the WPCSA is HUGE! What an amazing year it has been. This year was a transition year for Sprocket. He has spent many years with intense training at least six months out of the year. This year, he was still with Mike in training, but he had some new riders and new divisions in 2010. So what was new? WALK-TROT! 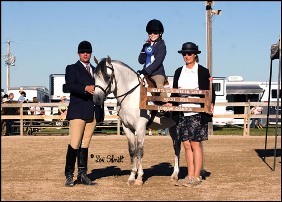 Sprocket was ridden extensively by Juniors this year, both at home and at shows. At Ohio, Will rode Sprocket to sevral ribbons in his first walk-trot classes off the leadline. Although some were concerned about there being a stallion in the walk-trot ring, Sprocket took special care of his rider even when Will's nerves got the best of him. At Heartland, Sprocket racked up three championships! 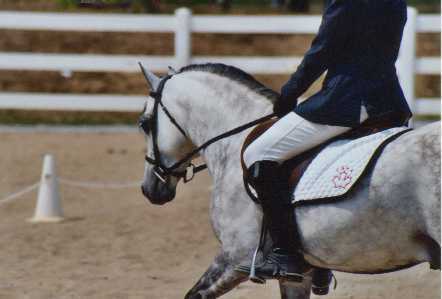 With Mike riding, Sprocket swept the three English Pleasure classes and was named Champion A/B Adult English Pleasure. Earlier in the day he carried Mandie L. and Joelle H. to three blues each and was named the Leadline and Walk-Trot Champion. Sprocket will be standing at public stud in 2011. His stud fee for 2011 is $700, which includes a $200 booking fee. Please contact Jen to find out if he will be at Sommer Pony Farm or RRR Farms, Ltd. when you would like to have our mare bred.